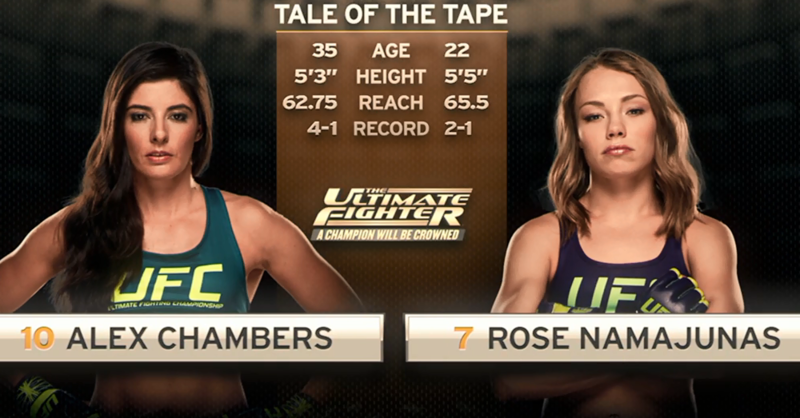 Carla Esparza vs Jessica Penne The Ultimate Fighter 20 Dec 10, 2014 (19:33) Carla Esparza vs Jessica Penne from episode twelve of The Ultimate Fighter 20: A Champion Will Be Crowned from 2014. 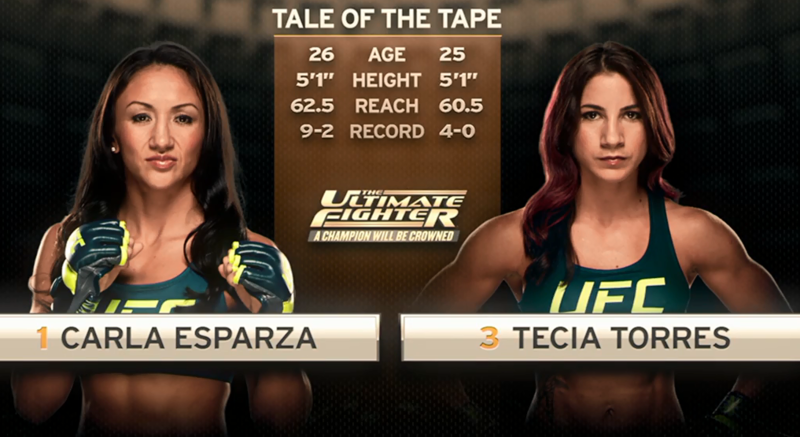 Carla Esparza vs Tecia Torres The Ultimate Fighter 20 Dec 3, 2014 (13:41) Carla Esparza vs Tecia Torres from episode eleven of The Ultimate Fighter 20: A Champion Will Be Crowned from 2014. Jessica Penne vs Aisling Daly The Ultimate Fighter 20 Nov 26, 2014 (21:20) Jessica Penne vs Aisling Daly from episode ten of The Ultimate Fighter 20: A Champion Will Be Crowned from 2014. 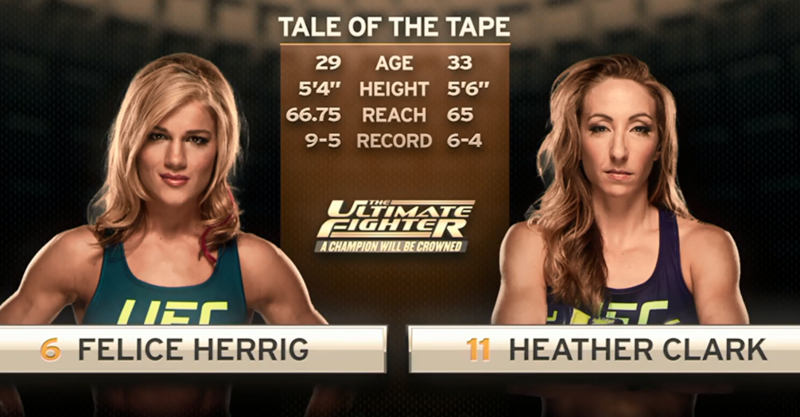 Tecia Torres vs Bec Rawlings The Ultimate Fighter 20 Nov 12, 2014 (14:34) Tecia Torres vs Bec Rawlings from episode eight of The Ultimate Fighter 20: A Champion Will Be Crowned from 2014. Aisling Daly vs Angela Magana The Ultimate Fighter 20 Oct 29, 2014 (17:46) Aisling Daly vs Angela Magana from episode six of The Ultimate Fighter 20: A Champion Will Be Crowned from 2014. Carla Esparza vs Angela Hill The Ultimate Fighter 20 Oct 1, 2014 (7:36) Carla Esparza vs Angela Hill from episode four of The Ultimate Fighter 20: A Champion Will Be Crowned from 2014. 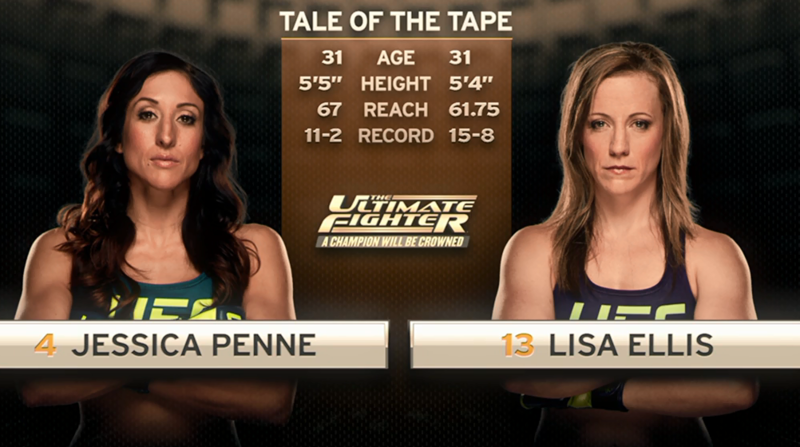 Jessica Penne vs Lisa Ellis The Ultimate Fighter 20 Sep 24, 2014 (7:39) Jessica Penne vs Lisa Ellis from episode three of The Ultimate Fighter 20: A Champion Will Be Crowned from 2014. 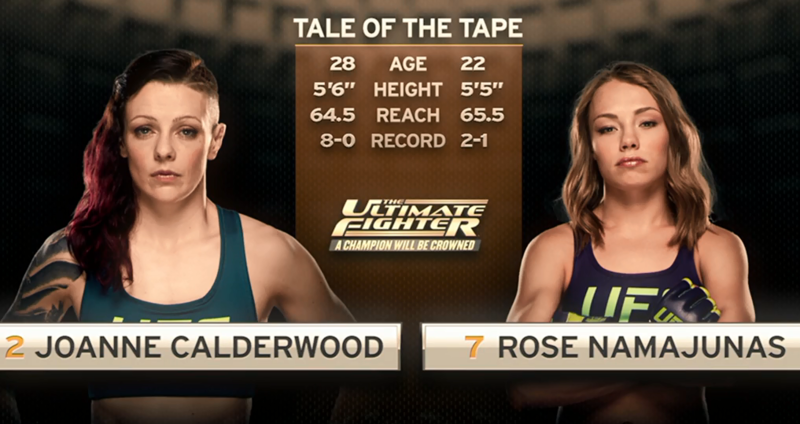 Joanne Calderwood vs Emily Kagan The Ultimate Fighter 20 Sep 17, 2014 (15:04) Joanne Calderwood vs Emily Kagan from episode two of The Ultimate Fighter 20: A Champion Will Be Crowned from 2014. Randa Markos vs Tecia Torres The Ultimate Fighter 20 Sep 10, 2014 (23:05) Randa Markos vs Tecia Torres from episode one of The Ultimate Fighter 20: A Champion Will Be Crowned from 2014.